The Days of Whine and No-says. In space... no one can hear you sigh. MAN... THINGs just ain't right. An Idol Pursuits - 6-Dimensions of Dr. Strange entry. As promised yesterday, I am going to showcase a few items that not only have much to do with my "6-Dimensions of Dr. Strange" mentality but also are UP FOR SALE on the eBay! (But read this post anyway. 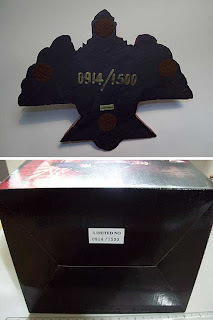 It's got some nice info and sweet pics of the items in question. This time around, we hop the company fence to graze in DC COMICS' back yard. 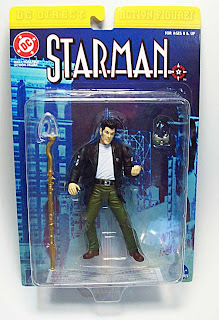 Not just any Starman, but the awesome JACK KNIGHT Starman. 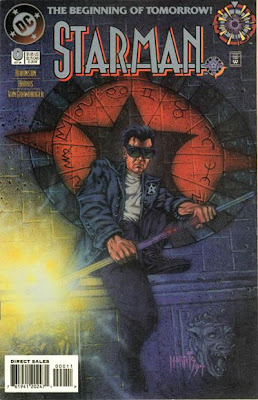 Created by James Robinson and Tony Harris, I started reading the exploits of the Jack Knight Starman as DC's "ZERO HOUR" craziness was going down. This was what... 1994... right? I was working at the aforementioned (in other posts on this blog) BonMark Books in East Meadow, NY (a lovely antiquarian bookshoppe / comic shoppe that has since gone away) and was getting my monthly fix of 4-colored goodness via a sweet employee discount. Because of that discount, I was more than willing to buy tons of comics that I otherwise would have little interest. Thus Green Lantern and multiple other "Zero Hour" titles caught my fancy. My interest in the character was, at first, purely one of nerd interest. Y'see, Jack was a collector of cool items of every sort. 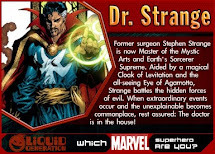 If DOCTOR STRANGE was the "mental & spiritual me", then STARMAN was the "physical & collector-minded me". 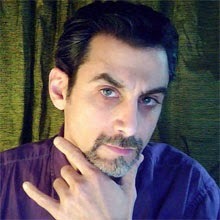 Add to the fact that there was a striking resemblance... a tousled black mane, goatee (ghotee? ), a penchant for weird print "Hawaiian" type bowling-shirts, a black leather jacket AND I wore goggles like that for awhile in lieu of standard sunglasses (the "wraparound" conforming nature of the goggles helped ease my eyes from my then-allergies to pollen and whatnot). Then, my interest in the comic grew into artistic awe, as Tony Harris began getting his vibe on for the art chores and Robinson's story grew and expanded upon it's own mythology. As both a writer and illustrator, I couldn't help but be impressed with the work being done. To the point that I bought EVERY ISSUE of EVERY comic title wherein Jack Knight or ANY of his supporting characters made appearances. (and will, sadly, be selling EVERY ONE of them off - sooner or later. Probably in a HUGE "complete set" type of haul)! However, this post isn't about the comics. This is about the SWAG! Because of my collector's mania, I bought whatever product came out concerning Jack Knight. And HERE, I will showcase them for you. I was going to leave this item for last, but it's too cool NOT to post FIRST! I mean just LOOK at this thing! 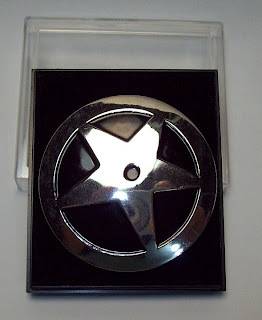 2 inches in diameter, and so shiny and cool... one of DC's very first "Prop Replica" type items, (long before they actually DID such things). 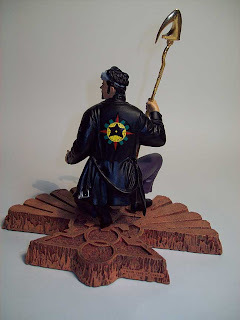 The Jack Knight STARMAN wore this item on the front lapel of his leather jacket. The basic story was; while getting "dressed" to go out for a patrol / battle, Jack was looking for SOMETHING that would be a "symbol" for his status as "super-hero" (without getting all spandex). In his assortment of tin toys / bubblegum premiums was a Sheriff's badge. With a STAR motif, and a "law keeper" angle, it seemed perfect! I'll confess that I desperately wanted to wear mine, but had long before learned my lesson against actually WEARING items that I collected. SOME people can do that without worry, but I had a bad history of losing my cherished swag, so I never took this out of the jewel case. Instead, I kept it proudly on display for a while (in a sealed glass display case - away from any light or sun, natch) until my wife and I made our first move. Then, it lay packed safely away, along with the other "non-Dr. Strange" items. Not to see the light of day for several years - until now. 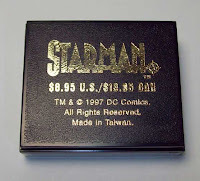 These things are so INCREDIBLY RARE... just type "Starman Badge" in a web-search and see how many people would seemingly give their arms and/or legs for this thing! They NEVER show up for sales or auctions! Such is the power of it's coolness. When you HAVE ONE... only hell or death can make you part with it. endingended SUNDAY, JULY 26 2009). 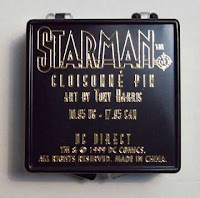 The STARMAN CLOISONNE' Enamel PIN! A little over 1.5 inches wide and made of Cloisonne' enamel baked onto a base-metal pin, this Zodiac / Astrological design is what Starman wore emblazoned upon the back of his leather jacket. The central STAR design worked along with the "stars" angle of the astrology chart. 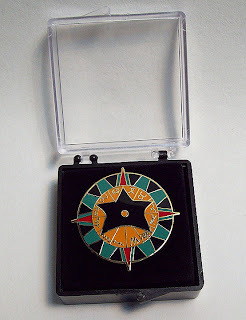 Anyway, much like the BADGE, I resisted wearing this item and never removed it from it's protective jewel case. This item, from 1999, is so rare that it almost doesn't register AT ALL on web-searches. Only the most die-hard fan had ever seen one or was lucky enough to score one. But now... my loss is YOUR GAIN! Get bidding quick, before it's gone! Yessir, this was a sweet "get". I can't quite explain the coolness of this piece. Aside from the overall design (based on Tony Harris' work), it just oozes "attitude" and "cool". It's a superhero statue that you don't have to feel self-conscious about displaying in your office (if any of you DO ever feel self conscious about things like that - I never did, but miles may vary). 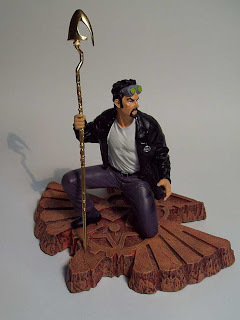 Dressed in his street-clothes "uniform", this is just a sweet piece of sculpture and design that everyone can appreciate. 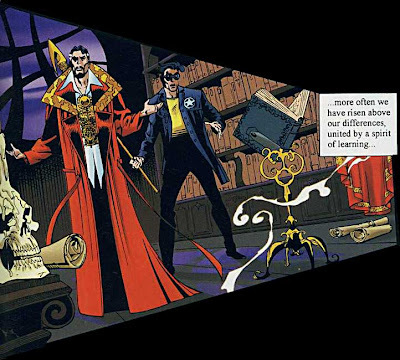 Every detail from the golden "cosmic rod" (and just what comic geek doesn't love that little euphemism) to the goggles and the Zodiac / Astrological design on his jacket is perfect. 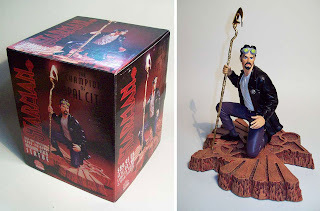 I had it on display in that sealed glass display case, but soon had to store it back in it's box, because my assorted Dr. Strange collection really needed that valuable real-estate. Look. 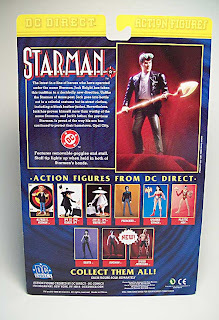 It's a STARMAN Action Figure! What other reason did I need for getting it?!? The Cosmic Rod has a little diode light bulb in it that lights up and glows when the rod is held in both of Starman's hands. C'mon! How is that NOT cool? If you're surprised this never got out of it's plastic coffin... (I'm always one to bust these things out to play), it's only because I bought TWO. I still have one loose (and will be keeping it if I have anything to say about it). Well... those are the items up for auction this week. Remember, the link for eBay sales is on the right side of the blog on the sidebar. HERE is the link to these eBay auctions. I would be remiss in my blogger duties if I did not fill you in on one of the cool little tidbits of "6-Degrees"
(aka; "6-Dimensions") that separate STARMAN and DR. STRANGE. Well... actually, in their case, it's only 1-Degree! That "Event" was MARVEL -VS- DC / DC -VS- MARVEL. 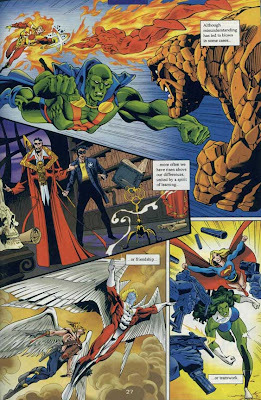 Starting off with a 4 issue cross-company mini-series, the event pitted many of the heroes and villains from each company against each other in various fights. 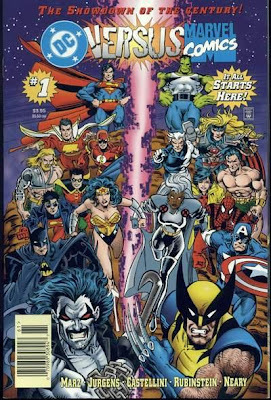 A select handful of these battles were to have their outcome dictated by "votes" from the readers (mail-in votes, iirc - which means that a popularity contest is the ONLY reason that Wolverine could possibly have defeated LOBO. But, I digress). However, not all of the meetings were voted on, or even became "featured" in the books. In issue # 1 we see that two heroes meet and do not fight. Instead, they (as the caption read): "...have risen above our differences. United by a spirit of learning." Those two learned, and enlightened heroes? That one panel made me buy the whole damned mini-series. 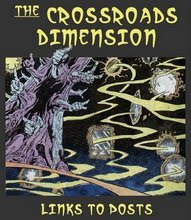 The ramifications from the inter-universal crossover was that they would then merge and find that characters from across the dimensional divide would combine with their counterparts. So, similar characters would merge to become a whole NEW entity. Thus was the "Amalgam Comics" line and universe born. Feel free to visit the eBay auctions and bid early and often. And keep looking to the STARS! Hey there, visitors to the Sanctum. The backlog of thoughts that I've had concerning the past few months' worth of comics has been pretty overwhelming (especially when added to everything else going on these days). To that end, I had every intent to post snippets, scans, thoughts and reviews here the past few weeks, but just can't seem to dig my way out from under. Brain... fuzzy. Energy levels... low. Ennui... rising. 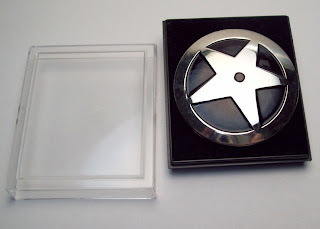 I'm looking to post some info on some stuff going up on eBay tomorrow (and how they fit in with my old 6-Dimensions of Dr. Strange philosophy), and then once that's out of the way, I'll redouble my efforts to bring this blog up to date. So much I still want (and need) to get to. 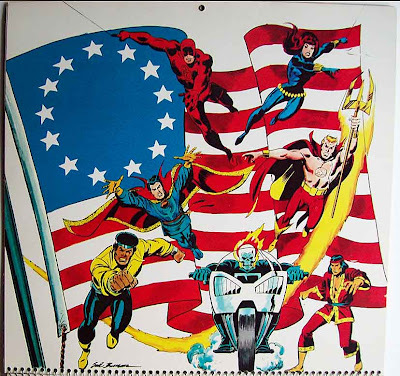 wish you all a Happy (and safe) 4th of July! Luke Cage; Power-Man, Ghost Rider and Shang-Chi; Master of Kung Fu. I have found that many comic fans who dwell -even partly - on the internets, young and old alike, seem to have been united in their love and fervor for "the little toy-comic-title that could". Of that, I speak of ROM; SPACEKNIGHT, the epic opus of Bill Mantlo, Sal Buscema (and later Steve Ditko) along with a treasure trove of guest inkers. For quite a few years, despite minor cameo appearances and veiled references, fans have been clamoring for a true revival of the title / character. Starting in December of 01979 and going on for a 75-issue run (plus 4 Annuals and guest-starrings in other's titles) ROM : SPACEKNIGHT told the story of a man from the far off planet of Galador (in the Golden Galaxy) who, when his world is beset by the evil, space-faring, shape-shifting, magic-weilding race of the DIRE WRAITHS, volunteers to be the first of many who would sacrifice their humanity to become cyborg warriors; a Spaceknight. After sending the evil marauders to rout, ROM follows them to Earth, where they have set up a beach-head and wages a war for our world's survival against a race that can shapeshift into anyone, a race that has been here for decades, lying in wait. Truly, that series was "Secret Invasion" done RIGHT. Many websites and articles extole the virtues of that series (which holds up as well today as it did when it first started 30 years ago) - even though they mostly universally lambaste the TOY that it was based upon. However, as much as fans of comics and toys BOTH wished a new version of ROM would be released (in comic and/or toy form) all hopes were held at bay by complicated rights' holdings. Parker Brothers, who created the toy, held rights in limbo, while Marvel let their rights slip when they stopped publishing the comic. Later, as detailed back in November 02008 [HERE], it was revealed that HASBRO (who now owns most of Parker Brothers holdings - as well as being the current holder for the rights to manufacture the toys and action figures for MARVEL) had filed for renewed rights to ROM: SPACEKNIGHT. However, as revealed [HERE] on the "ROM BLOG'' (by Lee Seitz - who runs the world's greatest ROM fansite - ROM Spaceknight - Revisited), the rights filing by Hasbro has hit a snag. Basically, they asked for terms that were far too broad. Also, they ran into another problem, in that the term Spaceknight is a difficult one to win, because Marvel still retains the rights to THAT term, since they had a 2001 mini-series of that name, which dealt with the tale of ROM's sons and their renewed war as Spaceknights. 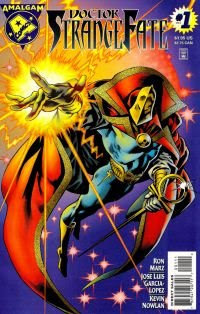 (Readers of Marvel's space-faring titles like NOVA and ANNIHILATION are familiar with the Spaceknights as well, since they made some brief appearances therein. 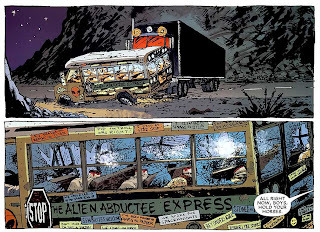 The term was also briefly scrawled across the side of a bus in a recent issue of Ghost Rider (# 34) which saw an "Alien Abductee" bus of hippies killed by a demonic trucker. Time is nearly over for Hasbro to re-file. 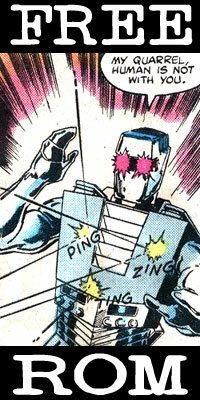 Any failure to properly comply could very well put the "brakes" on any further ROM: SPACEKNIGHT sightings for us in the near future. So, at this point, the future of ROM is still in the shadowy realm of Limbo. Statues and maquettes are big business. 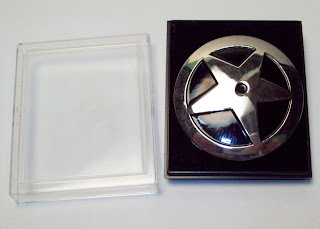 Collectors will plunk down major coin for 3D likenesses for their favorite characters / properties. 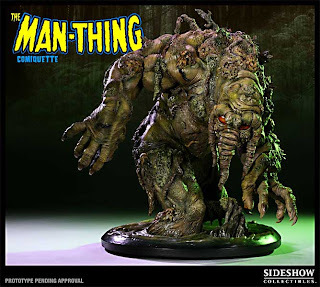 A $499.00 "comiquette" of the MAN-THING! Would I love to have one? Well, duh. SURE I would. But with the economy as it is (and this is not even taking my recent employment situation into account)... I would be hard-pressed to justify dropping 5 bills on this. This is exactly the kind of thing that has been gnawing at my completist collector's mentality as of late. I've been feeling more like prey than a prized fan or customer. Marvel (and many other such companies) are tapping deeper into the wallets of the declining numbers of their fan base and - seemingly - been taking our love for granted. At one time, only the most popular characters garnered such treatment, and slowly over time, the lesser known properties had been given the special treatment - much to the delight of their small (but very loyal) fanbase. However, over the years we've seen just about every lesser known entity being given "life" in such a high-profile manner. It has got to the point where many bloggers are astounded when the newest statues and busts are solicited, that the dregs of the character property pool are being turned into high-priced collectibles. It is to the point where every character is getting multiple statues, every old storyline is being reprinted ad nauseum in deluxe hardcovers and the fans are being asked to spend more and more. I own every representation of the Man-Thing (there are more than you may think) and Doctor Strange, among other properties... but I have been forced to take a more serious look at these items as of late. Many OLDER items are still highly sought after, and as rarer items (before the production numbers on such things has exploded to "1990s Image comic" proportions) and many of those older items are still "worth" a high price tag. But $500 for a giant Man-Thing statue? If the economy wasn't as it is (and I was still gainfully employed)... I'd probably be trying to rationalize a way to order this. But would that make any sense? Is it a case that ANY character is now viable for such a treatment? Or are we being fleeced?